- Sauerkraut, diced onions, relish and so on. This riff on the classic hot dog is made all the better when you start with a Hoffy Hollywood’s Original Natural Casing Premium Beef Frank. The snap from the natural casing is the texture we remember from an old-fashioned dog and the flavor is full of rich beefiness. With a couple of twists on traditional toppings, this dog will have you keep you coming back for more! Grill, broil or boil the Hoffy Franks until hot and steamy. Meanwhile, in a small mixing bowl, combine the ketchup and adobo sauce and mix to combine. In a separate bowl, combine the Dijon and horseradish and mix to combine. 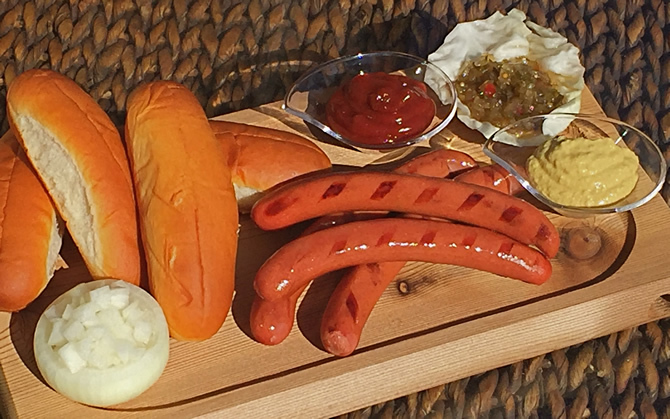 Set out the two sauces, along with warm sauerkraut, diced onions and relish and let your family and friends assemble their Hoffy Classic Dog just the way they like it!